Submitted by Angarrack.info ... on Fri, 06/09/2013 - 00:00. 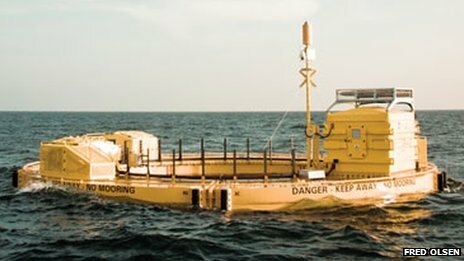 A wave energy developer says it is hoping to connect a device to the Wave Hub testing site in Cornwall. The device, called the Lifesaver because of its lifebuoy shape, could join the site off Hayle late next year, engineering firm Fred Olsen said. The 16m-wide generator drives a turbine via a device like a yo-yo inside. The £42m Wave Hub, a seabed-mounted electrical "socket" for testing wave energy machines, has been unused since it was installed off Hayle in 2010. Fred Olsen project manager Tore Gulli said: "We are hoping to be at Wave Hub for late next year or early-2015. "Wave Hub is exactly what we as developers need on our way to commercial operations." As well as the Lifesaver, Irish firm Ocean Energy Ltd (OEL) is expected to deploy a generator at the hub later this year.